Any plans for The Hill? I noticed this has just been posted on the door of The Hill, so its back on!! What even is the variation ! Job opening: Pub Operator - Hill Forest Hill at Craft Union Pub Company. "…You will receive 18% of the weekly turnover to pay yourself and your staff - be rewarded as a true reflection of your work ethic. What’s more you will also have a place to call ‘home’ with our pubs including private accommodation. You will require a £500 bond, to begin your business as a self-employed pub manager…"
I had no idea that pubs worked like this. Yeah me neither - fascinating. £500 bond is interesting too. I am new to the forum. I have lived in Forest Hill for two years now and am very keen to see Dartmouth Road reach its full potential. 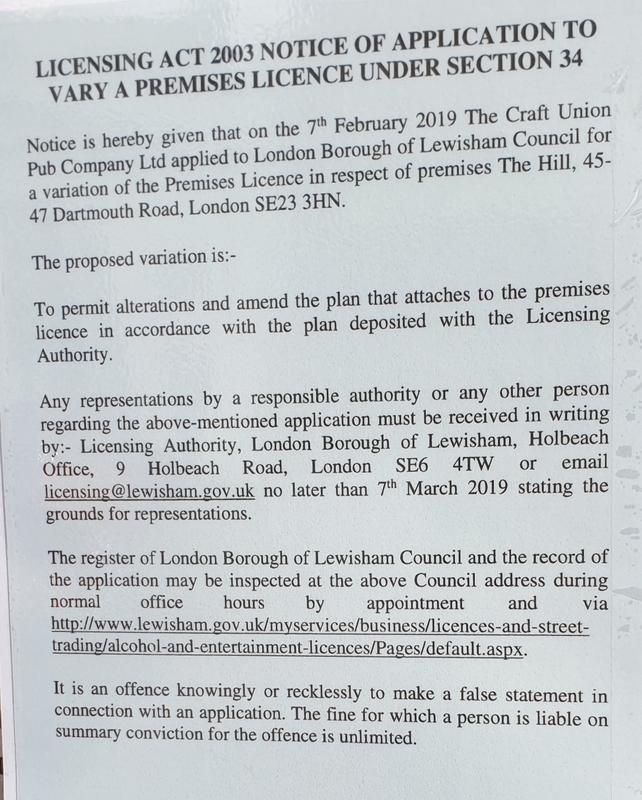 Finding a tennant for the hill is of course key to this but I have found out a few things about the Craft Union Pub Company which make me think they will do anything but improve the area. Craft Union Pub Company/Enterprise Inns are actually Ei Group PLC. (https://www.eigroupplc.com/en/index.html). It is worth reading their Wikipedia entry - https://en.wikipedia.org/wiki/Ei_Group. I won’t witter on here, but they appear to be a property company that deals in public houses and tenancies. In the short term (and from looking at google reviews) this could very easily mean the landlord/staff being treated unfairly, a badly run pub by people who have little experience etc etc. In the long term I suppose it means that Ei Group PLC would sell it at the right time to the best buyer regardless of what is best for the community. I don’t want to appear pessimistic, but as local people I think it is important to be aware of what is really happening in the area. At a time when craft beer, real ale and local brewers are booming, it seems such a shame that the way in which pubs are run is so often the obstacle in creating the right environment. I seem to be attracted to people who own or run pubs. Several friends are publicans both in and out of London. I hear a lot of their stories, particularly some who have found it impossible to keep afloat with current trading conditions, ties to pubcos or breweries, or even simple seasonality. I wouldn’t want to do it. Though the one’s the seem to do better are also the ones which own their pub outright. Their financial model, as described in the job is an interesting one. I forwarded it to a friend who is just giving up his pub outside London and he is likely to check this out. He’s a canny sort with almost two decades of experience in running and management pubs. I’d certainly trust his view on this venture and if he is happy to share, I’ll report back. I’m not ready to discount the Craft Union Pub Company yet, despite being part of the UK’s largest PubCo. I gather their ethos is focused on drinking and sometime sports. Food isn’t generally available. I feel Forest Hill could really benefit from another proper boozer. Sure, the Bird in Hand fills this space but there is nought wrong with some competition on Dartmouth Road. I know very little though about Craft Union pubs. One the nearest examples is the Lewisham Tavern on Lee High Road. I don’t know it. Does anyone? That might be a good example of what we could expect locally. I miss the Hill. It was a strange mix of food, booze and interior design. But we loved the “secret garden.” I’d be much happier to see a new company give it a go, rather than walk past the metal boarding each Saturday. And franky, the Hill would’ve been better without food. We have lovely pub and food offerings already! Of course this is also an alternative. A community-owned venture. If you want to know what the impact of Enterprise is on managing a pub, it may be worth looking at The Signal, even if it is another part of the portfolio - with different management. In my view The Hill is too big to just be a boozer. It has a kitchen and is more suitable for drinking and dinning than an old post office in a modern block across the road. But it is a building with numerous challenges in the layout and I think the owner is more interested in making money from the space above the pub. There is more quick money to be made from residential property than running a pub and my worry is that the pub will not reopen until the upstairs has been developed - but I could be wrong. I recall chatting with you about planning permission. I recall there is an issue about the accommodation as it is now or could be. But personally I don’t see an issue with its size. And a Craft Union pub doesn’t always exclude food. Frankly, I’d love a bowl of chips while watching England slaughter Wales. I don’t need a slow-cooked pork belly with a compression of beet root, heritage potatoes and micro herbs. But if as you suggest EI own the freehold, then any discussion on this matter is likely moot. Had no idea that the Signal was in the Ei portfolio. I like the Signal. For food, drink and entertainment events. I seem to remember reading somewhere that, although the intention was, or is, for The Hill to operate as a sports bar, some food such as pizzas, burgers etc - food deemed approprate for a sports bar- would be served. 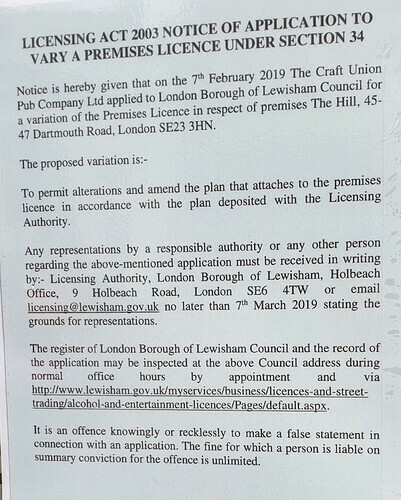 Re the licensing notice for The Hill above, any concerns or objections such as hours etc can be made to licensing@lewisham.gov.uk by 7 March. One thing I don’t get is they don’t actually say what the licensing terms applied for are. Does anyone know what they are ? Frankly, I’d love a bowl of chips while watching England slaughter Wales. Apparently it is opening as a sports bar. The company who are going to be running it recently refurbished a pub in Penge. Has anyone heard anything of this?